You guys! This is so exciting! I created a bundle of fabric...and it's all about prints! When I was asked if I would curate a bundle for Bernie's Etsy Store Needle & Foot, I didn't hesitate and said yes! I couldn't resist the opportunity...and hoped I'd be able to put together something wonderful! I'm excited to share my bundle with everyone and hope you love it as much as I do! 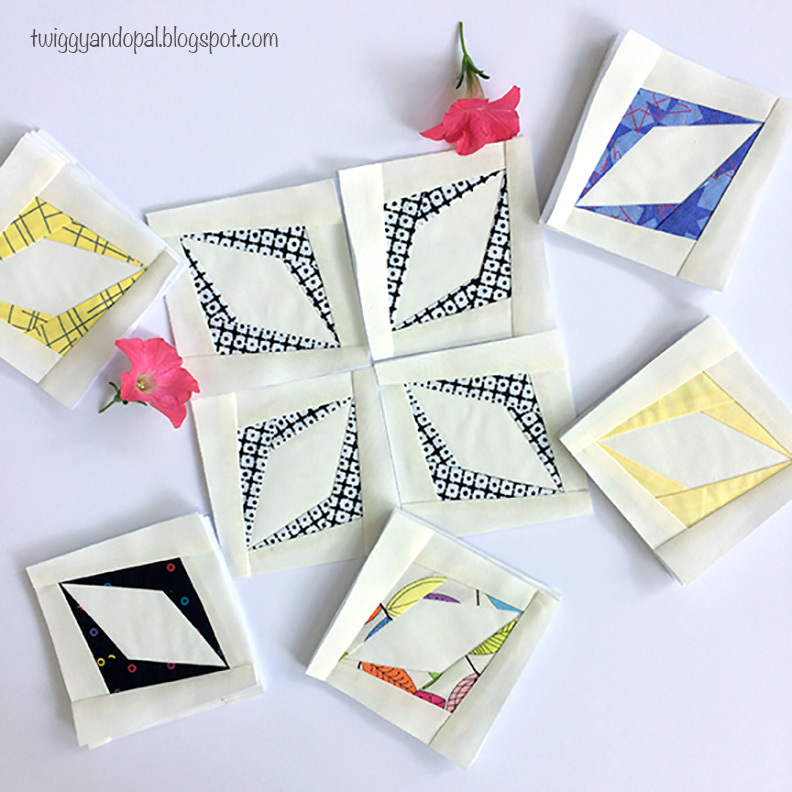 I wanted to pick fabrics that were Spring inspired, geometric and really just a lot of fun! Like a great big fiesta! A celebration of frivolity! Picking a cohesive bundle of fabric is much like picking flowers to plant! So many options! It can be overwhelming! But, I'm here to help you out! This bundle will be available in Fat Quarter and Half yard bundles at Needle & Foot on Etsy. And if you buy today or tomorrow, you can get 20% off! Great deal, right?! Click here: May Blogger Bundle to purchase and get 20% off! From left to right: Rainbow Vines by Kim Shaefer for Andover, Pick Up Sticks by Kim Shaefer for Andover, Panda Patches by Katarina Roccella for Art Gallery, Basic Circles by Laurel Burch for Clothworks, Flourish in Perriwinkle by Alison Glass for Andover and Yellow Color Weave by PB Textiles. When I say Rainbow Vines, you know I couldn't resist! The colors scream Spring! I didn't want to go 'crazy' with colors, so I choose yellow and periwinkle to lighten the mood, yet went with black to ground it! I know, I sound like I know what I'm talking about! In reality I went with my gut! I had big plans to make a finished something for this post! A last minute vacation and a whole lot of procrastinating didn't help me at all! I finally made myself focus long enough to make the blocks for my 'soon to be finished' project for this fabric! 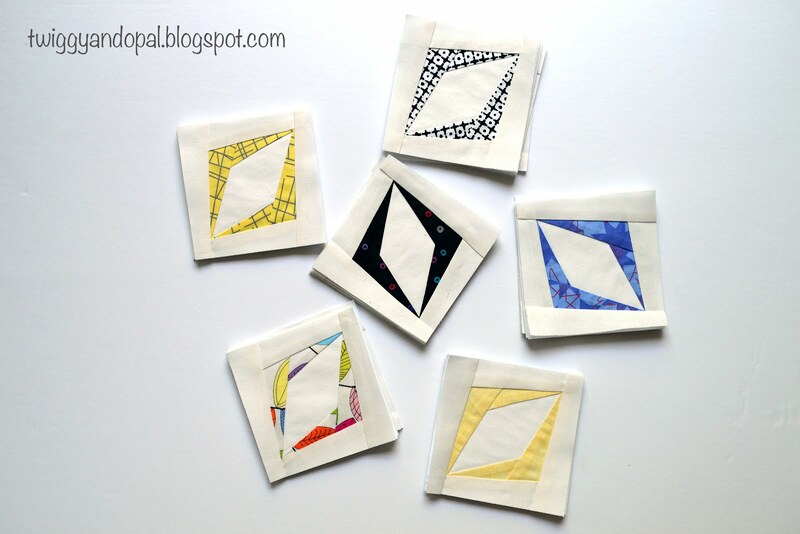 I've been longing to do some paper piecing! The block is by Flying Parrot Quilts and is free when you sign up for her newsletter. So far I have four blocks of each color. Each block will be 4" finished. I'm not sure how I'll arrange them, but I do know I'm going to make more! Perhaps a nice crisp table runner?! Thank you so much Bernie for trusting me with curating a bundle! I may be a bit biased, but I love this bundle! Please hop over to Bernie's Blog and read more about this bundle: Needle & Foot Blog! How would you like to win this stack of pretty fabrics? 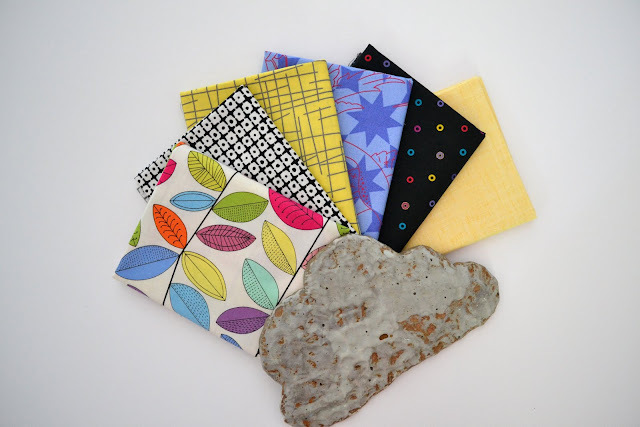 Bernie has generously offered this six piece bundle from Needle & Foot Fine Fabrics to one lucky winner! 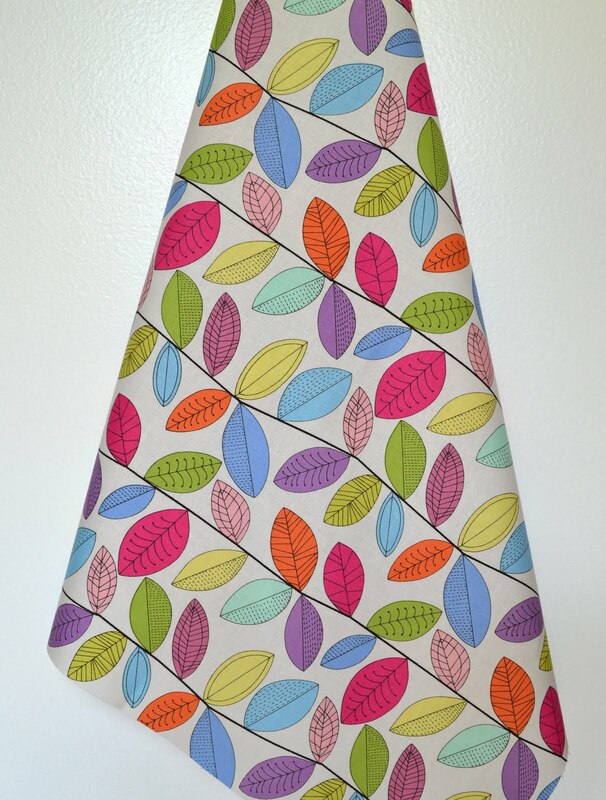 To enter this giveaway, click here: Needle & Foot on Etsy , and tell me your favorite fabric! I'll pick a winner using the Random Generator on Sunday May 20th. Open to US residents only. Be sure you leave your email in your comment if you are a no reply blogger! This giveaway has ended! Contgrats to Kathy E! I love your clever quilt-in-progress! There are so many beautiful fabrics, but I like Texture Slots Intense the best! Thanks! I love your selection of fabrics. Firefly Tang caught my eye. Love this pattern and the fabrics you've chosen! That Lantern, Moonshine is gorgeous, and I am all about the oranges right now! Love your block, I wasn't sure about those prints at large scale, but they work at the small scale. I love Wild Flower Shower-Subtle, Wild Bloom by BariJ for Art Gallery Fabric! I really love Sea Turtles in Turquoise Blue, Batik from Michael Miller. Great collection! Can't wait to see what you do with these blocks. Loving your choices and especially the Rainbow Vines! I've shopped Needle & Foot and always get awesome fabric. Today, my favorite fabric is Rainbow Rectangles by Andover. When I saw the bundle I wasn't sure if I liked it together. But when I saw how you were using it, I loved it!! I like the Basic Hearts prints. The print does not overpower the color. Jayne - what a great way to combine fabrics for a project. I was surprised when you selected prints since they are not often seen in your work but now I totally get it. Love these tiny blocks and looking forward to seeing this evolve. Thanks so much for working with me this month. I have really enjoyed it!! I have the perfect project for Rainbow Vines! I love the colors. I typically do not gravitate to bright yellow but you have done a fabulous work with this curation. I'm loving the Rainbow Vines! I haven't seen that fabric before and I love rainbow colors! Looking forward to your finish with these blocks of fabric. It would have to be the Rainbow Vines. Great collection, I love the colors! Well, in addition to your beautiful bundle, I like Rainbow Rectangles. Thanks for the opportunity to win! Oh your bundle of fabrics is wonderful, I'm drooling over the leaves! If I eliminate those fabrics though, my favorite in the shop is Village Houses, Paint the Town, GOTS Organic Fabric by Windham Fabrics. Pretty bundle!! Colorful with yellow—perfect way to say Spring! I saw your little paper pieced block the other day and was really drawn to the slant in it. It looks like a lot of fun to make. It sure is hard to pick just one favorite of Bernie’s fabrics. Might depend on the day. Today I’m thinking about a baby quilt, so my favorite is Uptown Birds in White by Kim Schaefer for Andover. i love your blocks. these will make a lovely table runner. such a pretty bundle you picked. I like the block you're making. 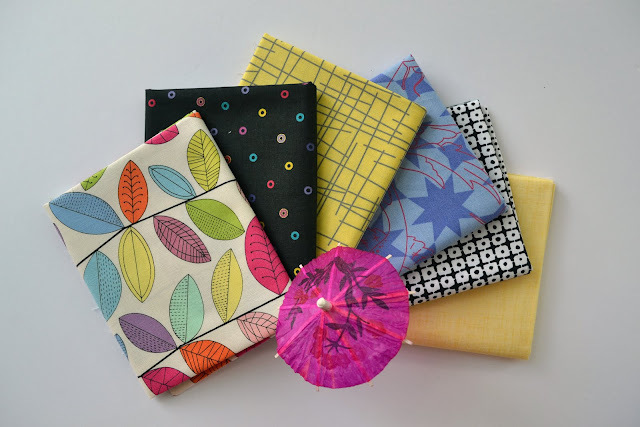 My favorite fabric, it's tough, I think I would go with the yellow pick up sticks, the second would be the rainbow vine. It's so hard to choose but I think I could use the pick up sticks right away. Your blocks are so creative! My fav fabric is a Fat Quarter Bundle - Gossamer, 6 Pieces, by Sharon Holland for Art Gallery Fabric. Thanks for the chance to win! My favorite fabric is PBT Elements Textured Plaid Fabric in Blue by P & B Textiles...love the texture. Your bundle is most excellent. I really like the rainbow vines..I like bright things! Your blocks are great. Can't wait to see the finish! Seriously?? Just ONE?!?! I could never choose, and you can tell when you see the glut of fabric I've accumulated. I am currently very captivated by those shimmery dots in any of the colors from Alison Glass, and also plaids, and also the low-volume prints.....see??! Don't make me choose! And all the pieces in your bundle are terrific, of course! There were so many wonderful fabrics but I would choose sassy cats in blue as my favorite. I love all things Alison Glass or Tula Pink. Katie Jump Rope fat quarter bundle is my favorite! This is a great bundle. I just love it...and that paper piecing is awesome as well. I love Village Houses, Paint the Town by Windham Fabrics. Lots of wonderful bundles and fabric but I love the Sea Turtles in Turquoise Blue, Batik from Michael Miller. Oh, Bernie has such great fabric. It was hard to choose, but I finally settled on Kohkhloma Burgundia as my favorite. Thank you to send me the paper piecing pattern of Flying Parrot.I've ever subscribed to your newsletter. 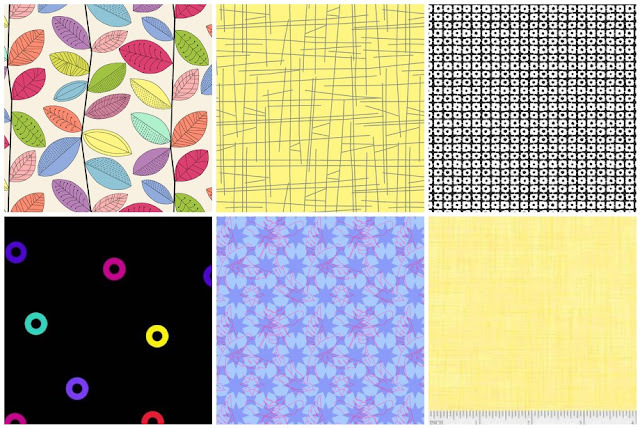 There are so many fabrics to like on Needle & Foot's Etsy site! The bundle you've curated is great. I love the blocks you're making, especially the Flourish in Periwinkle and the Panda Patches. Today, I think my favorite fabric in the shop is Terra Firma Sunlit-Garden Dreamer because I need some deep goldy-yellow for my stash! Nice collection, Jayne! I've had my eye on the black and white Panda print, the whole bundle would be even better! Right now I would pick "Renewal" by Alison Glass. Thank you for and Bernie for the chance to win. 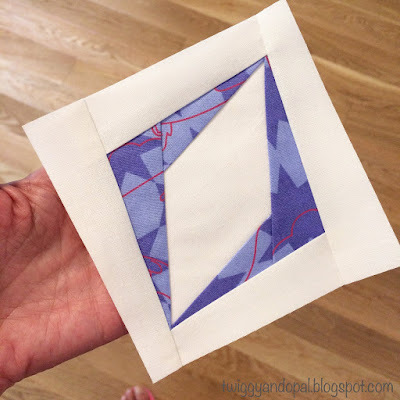 Love the quilt blocks you are making for your son's quilt. Love the Periwinkle and the Rainbow Vines and the way they play off the white. I'd love to win. Thank you. I just did a big shopping trip at Bernie's for the Fall into a QAL. I loved her shop and the fabrics were great. This bundle definitely says, "Fiesta!" There's an antique quilt I always wanted to make, but I didn't want to appliqué hundreds of leaves. That one fabric might be a good substitute! That is a beautiful bundle of fabric, Jayne, and the blocks you're making with it are really neat! I love the Rainbow Vines print especially! Thanks for the great giveaway! Great bundle Jayne. Thanks for sharing with Oh Scrap! 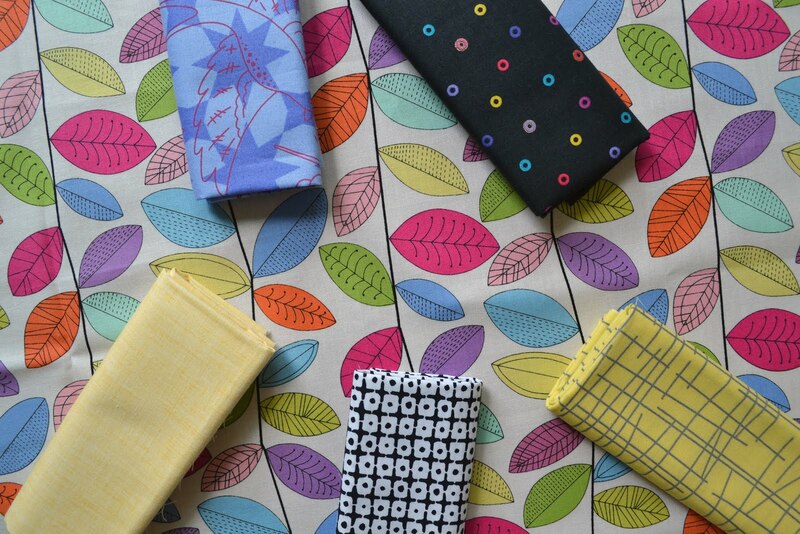 Bernie has such lovely fabrics - it would be hard to choose just a few. Love your blocks - the fabrics look great in there!